Whether you’ve had to leave your home for awhile due to damage from a fire or flood, or you are finally having the improvements you’ve always wanted completed, you need somewhere to stay. If you’re used to living in a home or apartment, it can be tough to give up all of the things that you’re used to if you have to stay in a hotel — a kitchen, enough space to be comfortable in, and several rooms. At Studio 6, we have all of the things that you need to feel like you’re home! Each room has a full kitchenette, and our suites have enough room for you and your family to spread out and relax. We have free high-speed Wi-Fi so you can keep up to date with your email, as well as stream all of your favorite shows. Our fitness center and business center means you can still work out and get your work done. We allow pets, so you don’t have to kennel your dog or cat while your remodel is complete! Our location is close to many businesses and universities, so you’re never too far from everything you need! 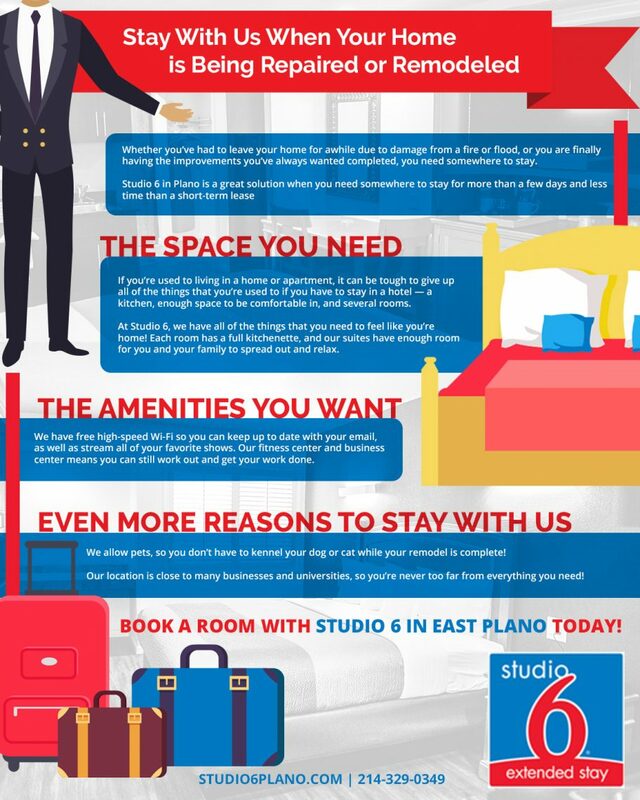 Book a room with Studio 6 in East Plano today!